[WATCH] How do planes stay up in the air? This great question was sent in by six year old Cathal, who can sometimes be found over at Bumbles of Rice blog; Cathal has a really scientific mind and is always asking him mum lots of questions. Sometimes she sends them on to me, which I really love. I thought that Cathal’s question was a great excuse to try out another whiteboard video, I hope you like it Cathal and keep those questions coming! How do planes stay up in the air when they are so heavy? It is a common question and one that we all want to know; especially if we are sitting on a plane about to take off! So if you want to know how planes stay up in the air, make sure you watch this video below to find out! Planes are pretty big machines; the world’s largest passenger plane is the Airbus A380 which can weigh as much as 560,000 Kg. That is a lot of plane to get into the air and keep it there. Even smaller planes, with all their equipment and passengers and baggage, are pretty heavy things, so how do they stay in the air? We think of air as being very light as we move through it all the time. But remember air is made up of tiny molecules that can actually be really strong too, there are lots of them and they can move together with quite a force. Air can be so strong it can blow over people, cars and even buildings when it moves very fast, like a tornado! It can be strong enough to hold a plane in the sky too, but we don’t need to create extreme weather conditions to do so, we just need to consider four important forces, and get them just right. The four forces are LIFT, GRAVITY, THRUST and DRAG! These four forces act in different directions… Lift pushes the plane up, Gravity pulls it down, Thrust propels it forwards and drag pushes it back. If we can get these four forces balanced just right, we can get a plane in the air, and keep it there. Let’s consider LIFT first, and to do that we need to look at the shape of the plane, and in particular… the wing. We call the wing shape an aerofoil, it is curved at the top, like this. This shape is designed to make air move faster over the top of the wing than below it. When air speeds up its pressure decreases (this is in keeping with a law of physics known as the Bernoulli’s principle). When the air pressure on top of the wing is less than the air pressure below the wing it creates a force called LIFT which pushes upwards on the wing. GRAVITY is the force that pulls the plane towards Earth; it keeps it on the ground. In order for the plane to get into the air, the LIFT force needs to be greater than the force of GRAVITY. To get enough air moving over the wings of the plane it need to be travelling through the air at quite a speed. We use engines to propel the plane forward using a force called THRUST! The more thrust is generated, the faster the plane goes and the more air travels around the wings. LIFT increases until its force is greater than that of GRAVITY and the plane takes off into the air. So far we have covered three of the four forces… LIFT, GRAVITY and THRUST. There is one more to consider… DRAG. DRAG can be described as a force that acts against a moving object. So, in this case, the plane is being propelled through the air, by the force of THRUST, but that air is moving against it, and creating a DRAG force. THRUST moves the plane forwards, DRAG pushes it backwards. In order to keeps the plane moving in the right direction, THRUST must be greater than DRAG. Planes are designed to be streamlined – to allow air pass around them with the least amount of resistance – to reduce DRAG. So a plane can stay in the air once the four forces… Lift (up), Gravity (down), Thrust (forward) and drag (backwards) are kept at the right balance. Essentially the plane needs to have no net force acting on it, which means that each of the forces balance each other out. Let’s consider one more law … Newton’s Law of Motion which states that an object at rest will stay at rest and an object in motion will stay in motion, once there is no net force acting on it. What this really means is that, once all these four forces are balanced, the moving plane, will stay moving… in the air… in flight! Which is just the way we like it! A big thanks to Cathal for sending in this question; if you have a question you would like me to answer just leave it in the comments below or sent it to me by email. What would happen if the Earth’s gravity suddenly disappeared? This was a recent question from my 10-year-old son… it certainly got some interesting discussions going around the kitchen table. When I opened up the question on my Facebook page I got more input from Cathal (5) and Ciarán (7) (from the Bumbles of Rice blog); they reckon that if you were indoors you would float upwards, or feel like you were being pulled up… and bump your head! A very good point boys; In fact, the bump on the head would be the least of your worries! Before I go any further though, it is important to say that this cannot actually happen, we can’t just turn off gravity, so when we discuss what would happen if we did, we are talking more science fiction than science; it is good to keep that in mind! SO WHAT WOULD HAPPEN TO YOU? As Cathal and Ciarán said, you would no longer have a force keeping you on the ground . The Earth would keep spinning, as it does, but you would no longer move with it, you would move in a straight line, upwards. In fact, rather than feeling like you are floating away from the Earth, you would probably feel like the Earth is dropping away from you! WHAT WOULD HAPPEN TO THINGS AROUND YOU? Anything not stuck down in some way would move in the same direction you would. Anything inside a building would get stopped by the ceiling, anything outside would float off into space, pretty quickly. WHAT WOULD HAPPEN TO THE AIR? Not only would solid objects float off into space but our air, our atmosphere would too; which means that unless you had an oxygen tank to hand you’d have no air to breathe. WHAT WOULD HAPPEN TO THE LAKES, RIVERS AND SEA? Liquids would leave the Earth’s surface too, so all the water on our planet, in lakes, rivers and seas would start to float off. A first, water would probably start floating off in large blobs, but as the atmosphere of the Earth disappears then the heat of the sun would penetrate to the Earth’s surface even more than it does now and water would probably start to boil off, into steam that would float off into space. WHAT WOULD HAPPEN TO THE BUILDINGS? So initially we said that if you were inside a building you would find yourself up at the ceiling; If you had an oxygen tank then you might be OK for a while. But you would start to feel those temperatures rise pretty quickly. The Earth would start to feel an incredible pressure which would ultimately mean that the buildings attached to its surface would start to break up and float away. Then rocks and clumps of earth would break off and float up too. WHAT WOULD HAPPEN TO THE WHOLE EARTH? Eventually, the whole Earth would break apart and float away into space, but we would be long gone by then. So while the notion of floating around in zero gravity might, at first, seems appealing, when we look at the idea a little more closely we realise it is not a very nice concept at all. Fear not, as I said at the beginning… this cannot happen, it is just an imagining of what would happen if it did. While scientists cannot really predict what would happen if we suddenly lost gravity on Earth, they can tell us the short term effect that lack of gravity (or weightlessness) has on our bodies… by observing what happens to astronauts while in space. Initially astronauts lose their sense of orientation, they find it hard to tell up from down. This disorientation can also make them feel sick for a while. Another issue they report is feeling like their arms and legs are disconnected from their body! The change in pressure can affect their vision a little, this may be due to the altered pressure on the eye ball, brain and spinal fluid (some astronauts report more long term problems when they return to Earth; recent studies have found a genetic link to this problem, but the exact mechanism is still unclear). They usually get used to these issues pretty quickly but there are greater health effects the longer they stay in space. Due to the lack of weight on their bodies, their muscles and bones begin to weaken; this is why astronauts spend so much time in space exercising! An astronaut will actually get taller in space; without the pressure of gravity on their bodies, they can stretch about an inch or more. Of course, once they return to Earth they soon return to their usual height. Astronauts immune systems can become weak in space too (the number of white blood cells that help to fight infection can reduce) and healing can be slowed down. Now that we have learned a little about gravity and the lack of it, here is a fun experiment; try out this gravity defying trick with a glass of water and amaze your friends and family! Fill the glass to the very top with water. Place the piece of paper over the mouth of the glass, making sure there are no air bubbles underneath. While holding the glass in one hand, and keeping the paper in place with the other, quickly turn the glass upside-down, over the basin (or ask an adult to do this for you). Once the glass is inverted remove your the hand that is holding the paper in place. The paper should stay in place and the water should stay in the glass. Watch all the amazed faces of your family and friends as they observe your gravity defying feat! While this appears to be an experiment about defying gravity, it is actually all down to air pressure. The lack of air in the glass produces a difference in air pressure on either side of the paper. The air pressure on the underside of the paper is greater than the pressure on the water side, pushing the air up and keeping the paper in place. I hope this experiment works for you without anyone getting wet feet! Be sure to let me know if you try it! Phew, I really need to wake up alert these days… barely had a sip of tea in me this morning when I got bombarded with lots of questions; I was glad to see that the back of the box of Kelloggs multigrain shapes has lots of fun information about the Stars, Sun, Earth and Moon! (Well done Kelloggs!) …but this lead to the question…..
…… WHY DOES THE EARTH SPIN? The earth spins because of intertia…. the tendency of a body of mass to remain in it’s state of motion unless acted upon by another force. Bit of a mouth-full isn’t it? What it really means is that an object that is at rest (not moving) will stay that way unless another force or influence changes that…. a stone on the ground will stay in place unless we kick it with our foot! Likewise a moving object will stay moving unless a force acts on it to stop it! Moving objects on earth stop moving due to friction (think of stopping your bike when you pull the brakes!). How was the Earth made? So how does all this relate to the Earth? Well the Earth is formed from a pile of moving gas and dust created during the big bang! As these gases and particles collapsed under their own gravity they started to spin. These spinning dust clouds continues to collapse until they formed planets – such as the Earth. As the planets formed they kept spinning and, in the absence of a significant force to stop them, they continue to do so! And that is why the Earth spins! How fast does the Earth spin? The Earth takes just under 24 hours to make one complete revolution – 23 hours 56 minutes and 0.4091 seconds to be exact. This is called the sidereal period (the length of time a body will make one complete orbit relative to the stars). So what is the speed of the Earth in kilometres per hour (kph)? It all depends of where you are standing! If you were standing at the North or South pole, for example, the Earth would be moving very slowly! If you were standing on the equator the speed of the earth will be moving at its fastest… that is to say, the circumference of the Earth is greatest at the equator and therefore must move faster to complete one revolution within a day! To better understand this try holding your finger on a point on a globe while you slowly spin the globe! Now for the maths…. the circumference of the Earth at the equator is approximately 40,000 km. If we divide this by 24 (the approximate number of hours in a day) we get 1,667 kph (approx 1000 mph). 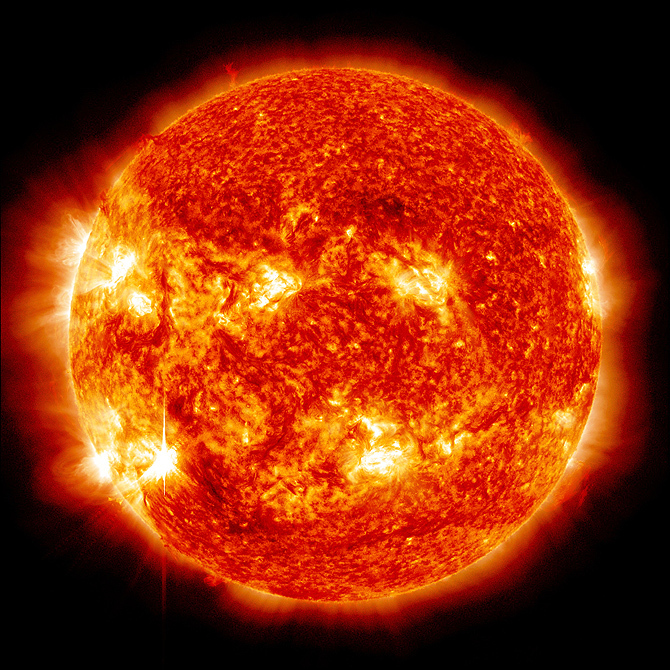 The Earth orbits the Sun at a speed of approximately 108,000 kph (67,000 mph). Do all the planets spin? Yes they do but not in the same direction or at the same speed. The inner planets of Solar System (Mercury, Venus, Earth and Mars) spin at a slower speed than the outer, larger planets ( Jupiter, Saturn,Uranus and Neptune). They all spin in a counter clockwise direction – as viewed from the top (or in a west to east direction), except for Venus and Uranus. The reason for this is thought to be the result of a significant collision during the formation of these planets . Stars spin too. The Sun is a giant star at the centre of our solar system and it rotates on it’s axis, taking 25 days to make a complete revolution!